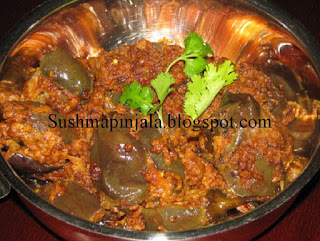 Slit brinjals and keep them in water. 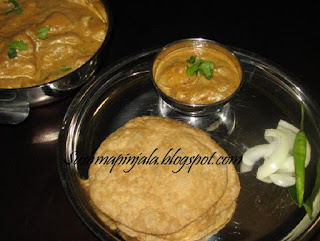 Mix peanut powder, salt, chili powder, onion paste,haldi,salt and ginger garlic paste. Now stuff the mixture in brinjal and drop each one in oil. Continue the process with all the brinjals. Add the left over stuffing into the pan and close with lid. Cook on low to medium flame only till done. Heat large pan and add oil. Now add mustard, cumin,chana dal,curry leaves and red chillies. Saute and add green chillies and chopped tomatoes. Now add ginger garlic paste, haldi, salt and chilli powder. Cook till tomatoes are soften and are easily mashedup when you press them with spatula. Now add cooked rice and mix well. Look for taste and add salt if required. Now add cilantro and mix well. In presser cooker add 1sp oil, chopped carrot and moong dal. Add haldi and presser cook till done. In another pan add rest of the oil, mustard seeds, cumin, red chili, udad dal, chana dal and curry leaves. Saute for few seconds and add ginger, garlic and green chili paste. Saute till raw smell dissappears. 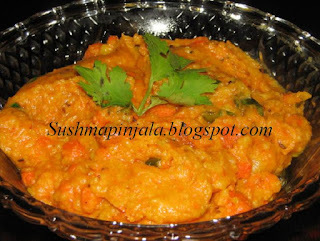 Mash dal and carrot with spatula and add it to the pan. Mix well and add salt to taste, garam masala and chili powder. Cook for 5 minutes on medium flame and garnish with chopped cilantro. Serve hot with rice, roti or naan. 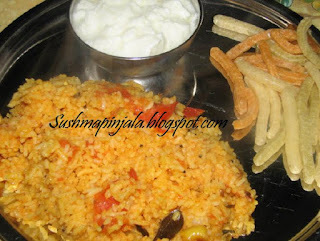 Check to see what my fellow bloggers are cooking for Blogging Marathon 23. Add milk and egg to pancake mix and beat well, so that no lumps are formed. Now add thinly grated carrots. Heat pan and spray little oil or butter. Pour little quantily of pancake mixture on the greased pan. Cook on low flame for a minute and flip over. Cook for another minute and remove. Continue is process till the mixure is done. Do not store the remaining mixture as it becomes brown in color after sometime and doesn't taste good if you use it again. 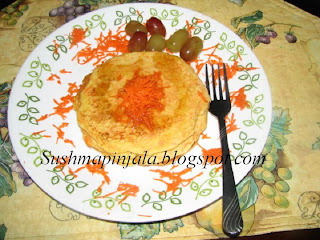 Serve hot with maple syrup and garnish with grated carrot. Add eggs, water and oil to cake mix and blend well. Add 3/4 of the cupcake moulds. Bake on 350 degrees F for 25minutes. To check if the cake is completely baked, take a knife or toothpick and drop it in the middle of the cupcake. If the knife comes out clean that means its completely done. If not bake for another 5 to 10minutes. 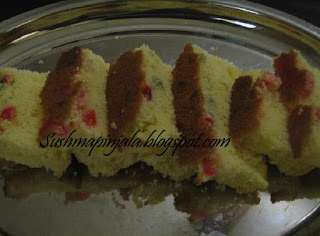 Thats it simple and yummy cake is ready to serve. Puff pastry sheets are available in the frozen section of any grossery store. Let pastry sheets come down to room temperature. Cut each sheet to 3/3 inch sheet like a square. Spread little jam in the middle of the sheet and few cherry pieces on the top. 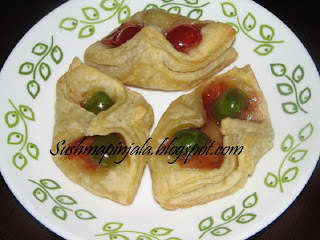 Fold the pastries as shown below. Place each pastry on the greases baking tray and bake them for about 20minutes. Serve as a snack or as a dessert. Check to see what my fellow bloggers are cooking for BM 23. Just follow the instructions as on Cake mix by adding 3 eggs, oil and water. Mix well with blender or hand mixer. Add little all purpose flour to cherries and chopped cashews. Mix these in cake mix and fold well. Grease the cooking tray and transfer the mix into it. Just to see if the cake is fully bakes poke a knife or toothpick into the cake. If the knife comes out clean, then the cake is ready. Let it cool to serve. Checkto see what my fellow bloggers are cooking for BM 23. Melt butter and add sugar powder and maida. Grease the tray or place and spread the dough pressing with ur hand to approximately 1/2 inch thick. 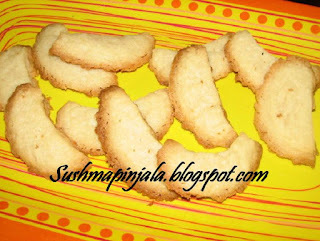 Take a small glass and cut the biscuits into half moon shape. Place each piece on a greases baking tray. Bake the biscuits for 15 to 17 minutes. Remove and let them cool. Heat large pan and add milk. Bring it to boil and add lemon juice. U have to break the milk. When u see all the water on the top switch off the stove and let it cool. Once its cooled take a muslin cloth or any normal cloth. Drain all the water and sqeeze the cloth tight so that all the water drains out. Now transfer it to different bowl and add sugar. Just with ur potato masher mash it so that sugar is completely mixed. Put this mixture in fridge for about 1 hour. 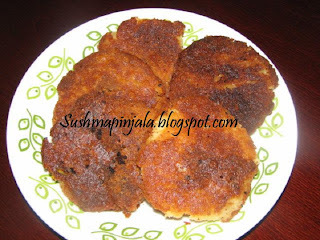 Take out from fridge and make small patties of it. If u r unable to make patties it means that there is still water in the mixture which u need to drain off. Boil 1 cup of milk along with saffron. Now add the patties in milk and cook for 5 minutes. 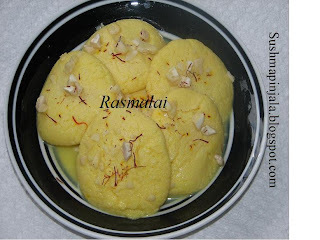 Now in a serving bowl place the rasmalai patties and pour the milk on top. Garnish with chopped almonds, cashews and pista. Karanji is a deep fried dumpling with a filling of grated coconut sweetened with sugar and flavoured with powdered cardamom seeds. It is also known as Kanavale. 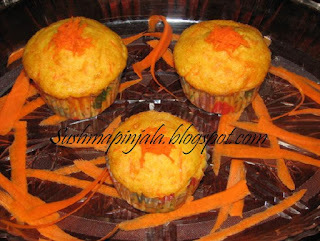 It is one of the popular sweets prepared for Diwali celebrations. Add sooji, salt and oil to all purpose flore and mix well. Now add warm water to make a stiff dough. Knead well and keep aside for 30mins. To make filling dry roast poppy seeds. Now add grated coconut, poppy seeds, elachi powder, broken cashew, raisins to powdered sugar and mix well. Now take little dough to make a small size poori. Apply little milk or water to the edges of poori. Now fill a spoon full of the coconut filling. Now close the poori gently to make a dumpling. Make all the dumplings and keep aside. Meanwhile heat oil for deep frying. Soak rice over night and drain the water. Let the rice dry for 30minutes. Now make a fine powder wiht the rice. Meanwhile heat pan and add grated jaggery and 1/4 cup water. The syrup has to be 1 string consistancy. Remove form heat and add rice flour little at a time and mix well. Finally add ghee and mix well. Take a plastic apply little oil or ghee to the plastic sheet. 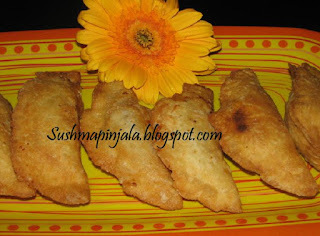 Take small size dough made with rice flour and jaggery. Press with ur fingers firmly to make a round pattie. Do not make too thin. Deep fry in oil till golden brown.